Description: A healthy continental breakfast of croissant pastries, orange juice, oranges Illuminated with golden early morning sunshine. Royalty free photo Healthy Continental Breakfast Croissant and Orange Juice with a maximum resolution of 3744 x 5616 pixels. The image Healthy Continental Breakfast Croissant and Orange Juice is one of 23697 photos in the category Essen & Trinken and has been part of ClipDealer's stock since 28 Jun 2010 18:32:17. 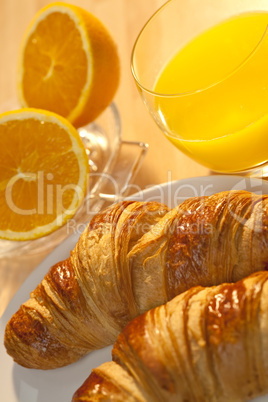 Healthy Continental Breakfast Croissant and Orange Juice is released for Kommerzielle und redaktionelle Nutzung.